Watanabe, S., M. Fujita, S. Kawazoe, S. Sugimoto, Y. Okada, R. Mizuta, and M. Ishii, 2019: Frequency change of clear-air turbulence over the North Pacific under 2 K global warming – Ensemble projections using a 60-km atmospheric general circulation model. J. Meteor. Soc. Japan, 97, https://doi.org/10.2151/jmsj.2019-038. Plain Language Summary: Global warming may influence geographical distributions of clear-air turbulence (CAT) hazardous for aircrafts. 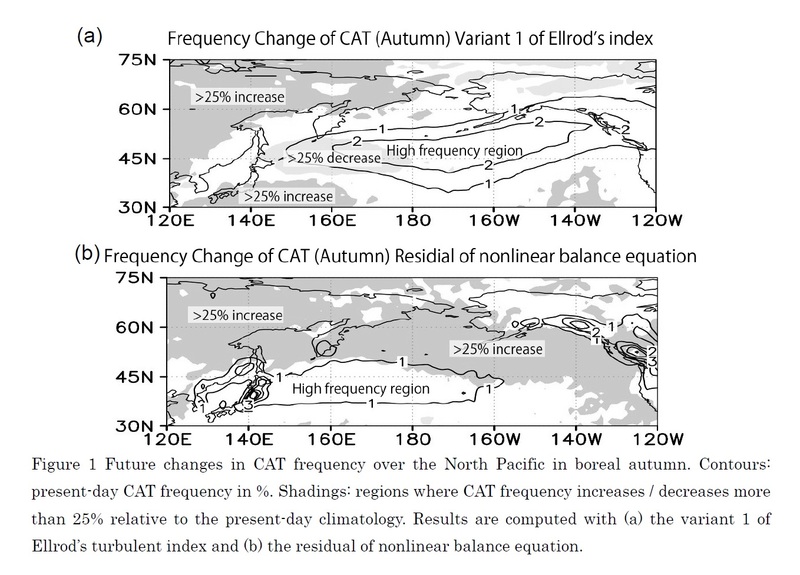 This study addresses frequency change of CAT over the North Pacific under 2 K global warming based on the database for Policy Decision making for Future climate change (d4PDF; http://www.miroc-gcm.jp/~pub/d4PDF/index_en.html ). The CAT broadly decreases in the midlatitude central to western North Pacific along with the south side of its present-day high-frequency band extending from Japan to the eastern North Pacific. Meanwhile, large relative increases are found outside the band, implying an increased risk of CAT encounters. These changes depend on season, CAT indices, and uncertainties in future warming patterns of sea surface temperature projected by climate models. Frequency change of clear-air turbulence (CAT) over the North Pacific under 2 K global warming is addressed based on the large-member ensemble climate projection database (d4PDF). The CAT frequency decreases more than 25% in the midlatitude central to western North Pacific, whereas increases outside the present-day high frequency region. Future changes in CAT frequency depend on season, generation mechanisms of CAT, and uncertainties in future sea surface temperature change patterns.